Although completely different, some people may call turnips “rutabagas” and rutabagas “turnips.” Why? Well, aside from the fact that both belong to the Brassica family, they also have a similar appearance. But what is the difference between the two? This will be discussed in this article. A turnip has a mild, sweet flavor. The taproot contains a high amount of vitamin C, while the leaves contain vitamin A, C, and K, folate, lutein, and calcium. Turnips thrive in moist soil with high levels of organic matter. They are abundant during the summer. The smaller varieties are preferred for cooking because they are more tender, while large varieties are usually used as animal feed. On the other hand, a rutabaga (Brassica napobrassica) is a large root vegetable with yellow flesh. Its thick skin is usually a combination of dirty yellow and dark purple, and its roots are dense and large. It is believed to be a combination of a turnip and a wild cabbage. 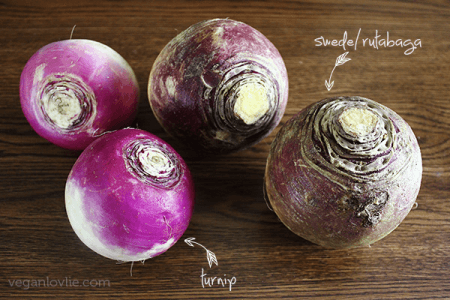 In some areas, it is called “swede” or “yellow turnip.” Sometimes, it is called “waxed turnip” because of the wax that covers it to preserve it during the cold months. The flesh of the rutabaga is sweet. It is dense so it takes a while to cook it. It also contains a small amount of moisture which means it is not highly perishable. Rutabaga roots contain vitamin B6, vitamin C, fiber, calcium, potassium, and phosphorus. Rutabagas can be grown in cold areas as long as the soil is rich and well-drained. A high amount of organic matter in the soil may cause the roots to be deformed. What, then, is the difference between a turnip and a rutabaga? A turnip (Brassica rapa) has white flesh. Its skin can be white, white and red, or white and purple. On the other hand, a rutabaga (Brassica napobrassica) has yellow flesh and its skin is a combination of dirty yellow and dark purple. In terms of size, taste, and texture, a turnip is smaller and has a milder taste than a rutabaga. A rutabaga is large and has a sweeter taste and a denser root, so it cooks and stores longer than a turnip. Moreover, commercially sold rutabagas are usually covered in wax to preserve them during the colder months. A turnip needs a temperate climate and moist soil that is rich in organic matter, while a rutabaga thrives in cold areas with well-drained soil with less organic matter.